Do Vacation Time Shares REALLY save you Money on Vacations Vs Rentals?
. . . the answers are based on our 30+ years of Time Share ownership and exchanges in both the RCI and II membership time share exchanging networks. Also includes some Tips on RCI & II Vacation Time Share Exchanging plus Ownership Rental Tips -- even a discounted resale time shares by owner suggestion. Tip Don't miss the usually very affordable vacation time share condo rentals which are often available through the Vacation Time Share Resort. You do not have to be a Time Share Owner to Rent these! These condo rentals are usually very reasonably priced vacation timeshare weeks that owners who are not using them that year have placed for Rent thru the Resort. See Links below for listings of Virginia Beach and Cocoa Beach Florida Timeshare Vacation Condo Rental options. Question 2 cost comparison below - Do Time Shares Really Save you Money on Vacations?
" Free " Time Share Vacations - Getaways - Time Share Tours & Resort Timeshare Vacation Promotions + what to expect. Timeshare Vacation Promotions - Vacation Getaway Discounts & Deals -- even some free timeshare vacation Getaway Packages! 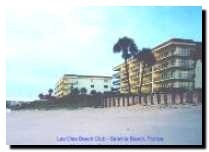 - Or - Our Florida Cocoa Beach Vacation Condo & Time Share Rentals Pg. 2. Do Time Shares Really Save you Money on Vacations? To analyze -- and try to compare "Apples with Apples." Vacation Condo Rental: If you were to shop around and Rent a nice Ocean Front 2-bedroom Condo in Virginia Beach at a peak (Red) time - June thru August, you would find that the current going price for a Week Rental ranges between $1,200 and 1,700 depending on the Resort and amenities. Lets say you are always able to get a good deal and use $1,200 for this example. Time share Purchase cost/year: I just (8/26/04) looked up some Owner Resell unit prices and find that current peak Red time (June - Aug) 2-bedroom Time share Weeks at Virginia Beach for this example are offered for sale between $6,500 up to $16,900. These are "Deeded" weeks Vs "Leased" weeks where you actually Own the Timeshare Real Estate Week and get a filed Deed. (In most experts view, best way to own Time Shares! - more on that below) Lets use a purchase price of $9,400 for this example. You either are borrowing all or some of the timeshare purchase price from your friendly Banker, or you are "using" some funds that prior to this purchase were earning you some rate of return. Lets say your Banker was very "Friendly" and/or that you were consistantly averaging about a 6% rate of return on the funds you used for this Time Share Week purchase. Technically we should subtract the Rental Cost of $1,200 from the $10,000 here since we would not have had use of those funds -- we were using them for the Rental with that option. This would make the "Funds Cost" of this purchase 6% times the: $9,400 purchase price - less the $1,200 we would have used for the Rental Condo + the $800 closing costs = $9,000 x .06 = $540/Yr. One of the Main Benefits of Time share Ownership is the ability to use your Unit week for time share exchanging to other time share Resorts at other times and locations all over the World. The current costs to belong to the large Resort Condomonium International(RCI) exchange Network and get their Time Share Exchanging Vacation Travel publications and thick Resort Listings Catalog is $89 per year. Interval International (II) is $79 per year. Lets use $90 per year here for easy figuring. Sometimes you will Vacation at your Home Resort, and sometimes you will want to do Time Share Exchanging to other Resorts in the Network. Lets say you exchange every other year. The cost of an Interval Exchange -- to "Spacebank" your time share week and to have their computers search out and do a time share exchange to another Week - Based on your Selection Criterion -- currently costs $139 at RCI (A little less at II - this fee has gone up over the years as Time share Exchanging has become more popular) Lets use $140 every other year or an average of $70 per year for this example. So what are are comparison Totals of the costs of Renting a Virginia Beach 2-bedroom Beach Front Vacation (Possibly Time share) Condo -- as compared with the Annual costs we have calculated above for owning our Time Share Week and having the option of time share exchanging? Rental - $1,200 per year - Only for the years we decide to go on a week's vacation using a Rental Condo. $ 70 - Average cost to Exchange every other Yr. Almost a wash when you have figured in the Annual Money costs -- but lets look at the other Outside Considerations for both Vacation condo rentals or Vacation time share rentals and Timeshare Ownership. You only have to pay Rental fees the years you take a week vacation using a Vacation Condo Rental -- No Condo Vacation that year, no rental fee. You have a wide variety of Rental Options available to you - many to Time share Condo Rentals available almost anywhere -- you do have to search them out on your own. You always know that you can go to your Great Home Resort which you picked in the first place because you liked the area and amenities. ( Tip - I think it is very important to purchase a Resort that you want to USE, not just because you think it will exchange well. Get Red (High) Time in either event since you can normally only exchange for the level of "Time" you have or less. You can exchange Up to "High" from "Medium" or "Low" Time for "last minute" exchanges only. (during 60 days before travel date) It greatly limits you when exchanging to not own a Red (High) time week! You also have the option of "SpaceBanking" your week in either RCI or II for up to 2 years so you can draw on it to combine with that years week for a 2-week Time share exchanging vacation later. Hopefully if you have picked a popular Resort Area and have good on-site Management, you will be able to contract with them to Rent your Unit for you in the years you do not use it or wish to "Bank" the fime for the future - and some of the time they may be able to rent it out for you. -- Or you can try renting it yourself. We were never able to successfully do that in the several years that we tried - using several online listings + online classifieds. We finally decided it was best to just pay the rental fee and turn it over to the onsite Rental Company - (I would caution against using an offsite Rental Company - or purchasing a Time Share in a resort which did not have an Onsite Management Company) - see why later. - We have found - for an overall average over several years (some with Rental Income, and some not) - that our average Net Rental Income from the weeks we had the Management Co. rent for us is just about equal to the total of the Annual time share Maintenance Fees and time share Vacation Exchange Network fees. We own 4 time share weeks in Florida - two more than we really need! Two are 1-bedroom Weeks in an II Resort that we bought in the "Construction Phase" in early 1980 that we were unsucessful in selling after we purchased two 2-bedroom weeks at a nearby "Under Construction" interval Timeshare resort in 1981. We tried to sell the 1-bedroom weeks a few times years ago, but the Resale Prices weeks were actually selling for were so far below the Prices we paid purchasing from the Developer - even during the lower priced Construction Phase - that we decided to just keep them and give them to the kids for use with their growing families later. Do NOT plan on a time share as an Investment that increases in value or provides rental income greater than your expenses. -- altho do talk with your tax preparer about putting it on your tax return if you rent it out regularly since you will want to offset the rental income with your yearly expenses. Tip If you are interested in purchasing a discounted -- or if you get lucky, even "cheap" vacation time share, definately check out the MANY resale time shares by owner that are available, often for big discounts as compared to purchasing one new direct from a time share Resort. These time shares by owner resales are often available from people who have purchased a vacation time share and then have found they cannot actually use their resort time share vacation week every year to justify the annual time share condo maintenance fees that are due regardless of whether the vacation time share week is used or not. (Remember, even if you get a resale time share week for only 10 cents on the dollar, you must fairly consistantly USE your vacation time share week to justify the ongoing annual maintenance fees you will be billed whether you use it or not.) See more our new Resale Time Shares by Owner page. It is highly recommended you get legal counsel and use some kind of 3rd party escrow whenever doing a resale by owner time shares purchase or sale transaction - online or otherwise. To Timeshare Basics - Pg 1: What are Time Shares? What are the types of Time Share Ownership? Fixed Time Vs Floating Time Weeks? - Advantages & Disadvantages. Vacation Clubs. RCI & II Time share Exchanging Tips . Discounted and almost " Free " Time Share Vacations - Getaways & Time Share Resort Tours. + What to expect and how to find the Top Getaway deals. Timeshare Vacation Promotions - Links to Vacation Getaway Discounts & Deals -- even some free timeshare vacation Getaways! Florida Cocoa Beach Vacation Condo & Time Share Rentals & Reviews Page - also includes Satellite Beach Resort and Timeshare Rental Reviews and Tips. We appreciate your Web Site suggestions or comments on our Comments or "Your Top Picks" Page. If you have some information or a link that you think would be appropriate for our Time Share Exchanging page, please send it using the form. Favorite area Florida / Virginia beaches area attractions and Eastern Florida or Virginia Beach places of interest you found interesting or memorable. Comments on great Florida / Virginia vacation Beach area Timeshare Resort weeks (preferrably ocean front) you may own, have exchanged to, or rented. Attached Time Share Resort or other Vacation photos to go with the comments are always appreciated!!!!! Links - Here you can check out our top Virginia discoveries of tested and annotated free beach vacations Information links - to to research futher if you see some Attraction Pictures and Captions in an area that interests you -- hopefully you can save some time (and even money) in getting set for your next visit to great Virginia Beaches!